GrubHub delivered the goods Friday. Shares of the online food ordering company finished the day with a 31% gain. The stock was up more than 50% at one point but pulled back as tech stocks fell hard. GrubHub priced its initial public offering of 7.4 million shares at $26 per share late Thursday. GrubHub raised nearly $200 million in the deal. At its current price, the company is valued at about $2.7 billion. It was pretty clear that there was strong demand for GrubHub, which trades under the symbol "GRUB (GRUB)." The company raised its initial price range of $20-$22 share earlier this week to $23-$25 a share. The company was formed last year via a merger of Chicago-based GrubHub and New York-based Seamless, and was named GrubHub Seamless. GrubHub has reported strong growth in the past few years. The company generated $137 million in revenue last year, up significantly from 2012, according to its filings with the Securities and Exchange Commission. It had 3.4 million "Active Diners" and more than 28,000 affiliated restaurants. But despite the growth, GrubHub's profits have been declining. Net income last year was $6.7 million, down from $15.2 million in 2011. The company is facing a potentially expensive lawsuit by a software company in San Diego that claims GrubHub, along with several other food and technology companies, violated patents related to online order-synching technology and online menus. The IPO market has been hot this year. In the first quarter, 64 companies went public, according to IPO research firm Renaissance Capital. That's more than double the number of IPOs in the same period last year. 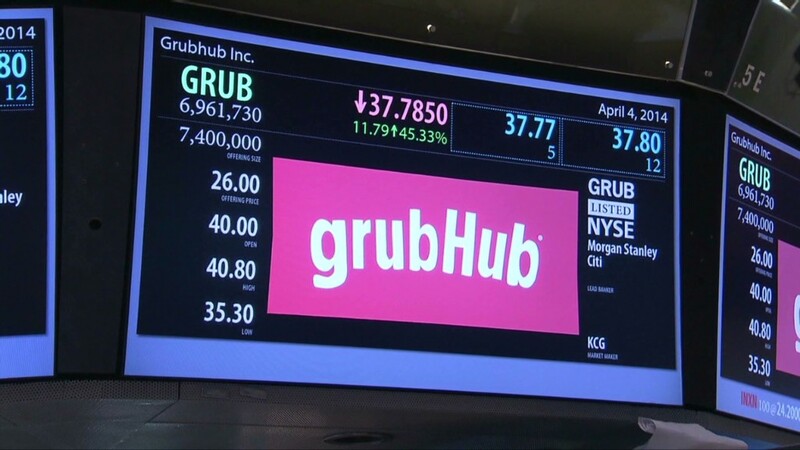 GrubHub was one of four companies making their stock market debut Friday. Software company Opower (OPWR) and IMS Health Holdings (IMS), which provides tech services for drug makers and hospitals, both ended the day higher. Five 9 (FIVN), which provides cloud software for call centers, also rose. But the company priced its IPO well below the expected range.